This article is about special eggs painted around Easter. For a secret message hidden in media, see Easter egg (media). Easter egg of the Ukrainian variety with the Paschal greeting "Christ is Risen!" The practice of decorating eggshells is quite ancient, with decorated, engraved ostrich eggs found in Africa which are 60,000 years old. In the pre-dynastic period of Egypt and the early cultures of Mesopotamia and Crete, eggs were associated with death and rebirth, as well as with kingship, with decorated ostrich eggs, and representations of ostrich eggs in gold and silver, were commonly placed in graves of the ancient Sumerians and Egyptians as early as 5,000 years ago. These cultural relationships may have influenced early Christian and Islamic cultures in those areas, as well as through mercantile, religious, and political links from those areas around the Mediterranean. The Christian custom of Easter eggs, specifically, started among the early Christians of Mesopotamia, who stained eggs with red coloring "in memory of the blood of Christ, shed at His crucifixion". The Christian Church officially adopted the custom, regarding the eggs as a symbol of the resurrection of Jesus, with the Roman Ritual, the first edition of which was published in 1610 but which has texts of much older date, containing among the Easter Blessings of Food, one for eggs, along with those for lamb, bread, and new produce. The blessing is for consumption as a food, rather than decorated. Lord, let the grace of your blessing + come upon these eggs, that they be healthful food for your faithful who eat them in thanksgiving for the resurrection of our Lord Jesus Christ, who lives and reigns with you forever and ever. Sociology professor Kenneth Thompson discusses the spread of the Easter egg throughout Christendom, writing that "use of eggs at Easter seems to have come from Persia into the Greek Christian Churches of Mesopotamia, thence to Russia and Siberia through the medium of Orthodox Christianity. From the Greek Church the custom was adopted by either the Roman Catholics or the Protestants and then spread through Europe." Both Thompson, as well as British orientalist Thomas Hyde state that in addition to dyeing the eggs red, the early Christians of Mesopotamia also stained Easter eggs green and yellow. The heathen Easter had much in common with May-feast and the reception of spring, particularly in matter of bonfires. Then, through long ages there seem to have lingered among the people Easter-games so-called, which the church itself had to tolerate : I allude especially to the custom of Easter eggs, and to the Easter tale which preachers told from the pulpit for the people's amusement, connecting it with Christian reminiscences. Although one of the Christian traditions are to use dyed or painted chicken eggs, a modern custom is to substitute chocolate eggs, or plastic eggs filled with candy such as jelly beans. These eggs can be hidden for children to find on Easter morning, which may be left by the Easter Bunny. They may also be put in a basket filled with real or artificial straw to resemble a bird's nest. The Easter egg tradition may also have merged into the celebration of the end of the privations of Lent in the West. Historically, it was traditional to use up all of the household's eggs before Lent began. Eggs were originally forbidden during Lent as well as on other traditional fast days in Western Christianity (this tradition still continues among the Eastern Christian Churches). Likewise, in Eastern Christianity, meat, eggs, and dairy are all prohibited during the Lenten fast. This established the tradition of Pancake Day being celebrated on Shrove Tuesday. This day, the Tuesday before Ash Wednesday when Lent begins, is also known as Mardi Gras, a French phrase which translates as "Fat Tuesday" to mark the last consumption of eggs and dairy before Lent begins. In the Orthodox Church, Great Lent begins on Clean Monday, rather than Wednesday, so the household's dairy products would be used up in the preceding week, called Cheesefare Week. During Lent, since chickens would not stop producing eggs during this time, a larger than usual store might be available at the end of the fast. This surplus, if any, had to be eaten quickly to prevent spoiling. Then, with the coming of Easter, the eating of eggs resumes. Some families cook a special meatloaf with eggs in it to be eaten with the Easter dinner. One would have been forced to hard boil the eggs that the chickens produced so as not to waste food, and for this reason the Spanish dish hornazo (traditionally eaten on and around Easter) contains hard-boiled eggs as a primary ingredient. In Hungary, eggs are used sliced in potato casseroles around the Easter period. Some Christians symbolically link the cracking open of Easter eggs with the empty tomb of Jesus. In the Orthodox churches, Easter eggs are blessed by the priest at the end of the Paschal Vigil (which is equivalent to Holy Saturday), and distributed to the faithful. The egg is seen by followers of Christianity as a symbol of resurrection: while being dormant it contains a new life sealed within it. Similarly, in the Roman Catholic Church in Poland, the so-called święconka, i.e. blessing of decorative baskets with a sampling of Easter eggs and other symbolic foods, is one of the most enduring and beloved Polish traditions on Holy Saturday. During Paschaltide, in some traditions the Pascal greeting with the Easter egg is even extended to the deceased. On either the second Monday or Tuesday of Pascha, after a memorial service people bring blessed eggs to the cemetery and bring the joyous paschal greeting, "Christ has risen", to their beloved departed (see Radonitza). In Greece, women traditionally dye the eggs with onion skins and vinegar on Thursday (also the day of Communion). These ceremonial eggs are known as kokkina avga. They also bake tsoureki for the Easter Sunday feast. Red Easter eggs are sometimes served along the centerline of tsoureki (braided loaf of bread). In Egypt, it's a tradition to decorate boiled eggs during Sham el-Nessim holiday, which falls every year after the Eastern Christian Easter. Coincidentally, every Passover, Jews place a hard-boiled egg on the Passover ceremonial plate, and the celebrants also eat hard-boiled eggs dipped in salt water as part of the ceremony. The dyeing of Easter eggs in different colours is commonplace, with colour being achieved through boiling the egg in natural substances (such as, onion peel (brown colour), oak or alder bark or walnut nutshell (black), beet juice (pink) etc. ), or using artificial colourings. A greater variety of colour was often provided by tying on the onion skin with different coloured woollen yarn. In the North of England these are called pace-eggs or paste-eggs, from a dialectal form of Middle English pasche. They were usually eaten after an egg-jarping (egg tapping) competition. In the Orthodox and Eastern Catholic Churches, Easter eggs are dyed red to represent the blood of Christ, with further symbolism being found in the hard shell of the egg symbolizing the sealed Tomb of Christ — the cracking of which symbolized his resurrection from the dead. 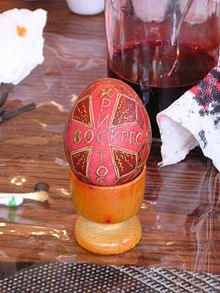 The tradition of red easter eggs was used by the Russian Orthodox Church. The tradition to dying the easter eggs in a Onion tone exists in the cultures of Georgia, Belarus, Russia, Czechia and Israel. The colour is made by boiling onion peel in water. When boiling them with onion skins leaves can be attached prior to dying to create leaf patterns. The leaves are attached to the eggs before they are dyed with a transparent cloth to wrap the eggs with like inexpensive muslin or nylon stockings, leaving patterns once the leaves are removed after the dyeing process. These eggs are part of Easter custom in many areas and often accompany other traditional Easter foods. Passover haminados are prepared with similar methods. Pysanky are Ukrainian Easter eggs, decorated using a wax-resist (batik) method. The word comes from the verb pysaty, "to write", as the designs are not painted on, but written with beeswax. Decorating eggs for Easter using wax resistant batik is a popular method in some other eastern European countries. In some Mediterranean countries, especially in Lebanon, chicken eggs are boiled and decorated by dye and/or painting and used as decoration around the house. Then, on Easter Day, young kids would duel with them saying 'Christ is resurrected, Indeed, He is', breaking and eating them. This also happens in Georgia, Bulgaria, Cyprus, Greece, Macedonia, Romania, Russia, Serbia and Ukraine. In Easter Sunday friends and family hit each other's egg with their own. The one whose egg does not break is believed to be in for good luck in the future. In Germany, eggs decorate trees and bushes as Easter egg trees, and in several areas public wells as Osterbrunnen. There used to be a custom in Ukraine, during Easter celebrations to have krashanky on a table in a bowl with wheatgrass. The number of the krashanky equalled the number of departed family members. An egg hunt is a game in which decorated eggs, which may be hard-boiled chicken eggs, chocolate eggs, or artificial eggs containing candies, are hidden for children to find. The eggs often vary in size, and may be hidden both indoors and outdoors. When the hunt is over, prizes may be given for the largest number of eggs collected, or for the largest or the smallest egg. The central European Slavic nations (Czechs and Slovaks etc.) have a tradition of gathering eggs by gaining them from the females in return of whipping them with a pony-tail shaped whip made out of fresh willow branches and splashing them with water, by the Ruthenians called polivanja, which is supposed to give them health and beauty. Cascarones, a Latin American tradition now shared by many US States with high Hispanic demographics, are emptied and dried chicken eggs stuffed with confetti and sealed with a piece of tissue paper. The eggs are hidden in a similar tradition to the American Easter egg hunt and when found the children (and adults) break them over each other's heads. In order to enable children to take part in egg hunts despite visual impairment, eggs have been created that emit various clicks, beeps, noises, or music so that visually impaired children can easily hunt for Easter eggs. Egg rolling is also a traditional Easter egg game played with eggs at Easter. In the United Kingdom, Germany, and other countries children traditionally rolled eggs down hillsides at Easter. This tradition was taken to the New World by European settlers, and continues to this day each Easter with an Easter egg roll on the White House lawn. Different nations have different versions of the game. In the North of England, during Eastertide, a traditional game is played where hard boiled pace eggs are distributed and each player hits the other player's egg with their own. This is known as "egg tapping", "egg dumping", or "egg jarping". The winner is the holder of the last intact egg. The annual egg jarping world championship is held every year over Easter in Peterlee Cricket Club. It is also practiced in Italy (where is called scuccetta), Bulgaria, Hungary, Croatia, Latvia, Lithuania, Lebanon, Macedonia, Romania, Serbia, Ukraine, Russia, and other countries. In parts of Austria, Bavaria and German-speaking Switzerland it is called Ostereiertitschen or Eierpecken. In parts of Europe it is also called epper, presumably from the German name Opfer, meaning "offering" and in Greece it is known as tsougrisma. In South Louisiana, this practice is called pocking eggs and is slightly different. The Louisiana Creoles hold that the winner eats the eggs of the losers in each round. In the Greek Orthodox tradition, red eggs are also cracked together when people exchange Easter greetings. Egg dance is a traditional Easter game in which eggs are laid on the ground or floor and the goal is to dance among them without damaging any eggs which originated in Germany. In the UK the dance is called the hop-egg. The Pace Egg plays are traditional village plays, with a rebirth theme. The drama takes the form of a combat between the hero and villain, in which the hero is killed and brought back to life. The plays take place in England during Easter. In 1873 J.S. Fry & Sons of England introduced the first chocolate Easter egg in Britain. In the Indian state of Goa, the Goan Catholic version of marzipan is used to make easter eggs. In the Philippines, mazapán de pili (Spanish for "pili marzipan") is made from pili nuts. The jewelled Easter eggs made by the Fabergé firm for the two last Russian Tsars are regarded as masterpieces of decorative arts. Most of these creations themselves contained hidden surprises such as clock-work birds, or miniature ships. Easter eggs are frequently depicted in sculpture, including a 8-metre (27 ft) sculpture of a pysanka standing in Vegreville, Alberta. Maria Magdalene, 1899 by Viktor M. Vasnetsov, depicted as one of the Myrrhbearers. While the origin of Easter eggs can be explained in the symbolic terms described above, among followers of Eastern Christianity the legend says that Mary Magdalene was bringing cooked eggs to share with the other women at the tomb of Jesus, and the eggs in her basket miraculously turned bright red when she saw the risen Christ. A different, but not necessarily conflicting legend concerns Mary Magdalene's efforts to spread the Gospel. According to this tradition, after the Ascension of Jesus, Mary went to the Emperor of Rome and greeted him with "Christ has risen," whereupon he pointed to an egg on his table and stated, "Christ has no more risen than that egg is red." After making this statement it is said the egg immediately turned blood red. Red Easter eggs, known as kokkina avga (κόκκινα αυγά) in Greece and krashanki in Ukraine, are an Easter tradition and a distinct type of Easter egg prepared by various Orthodox Christian peoples. The red eggs are part of Easter custom in many areas and often accompany other traditional Easter foods. Passover haminados are prepared with similar methods. Dark red eggs are a tradition in Greece and represent the blood of Christ shed on the cross. The practice dates to the early Christian church in Mesopotamia. In Greece, superstitions of the past included the custom of placing the first-dyed red egg at the home's iconostasis (place where icons are displayed) to ward off evil. The heads and backs of small lambs were also marked with the red dye to protect them. The egg is widely used as a symbol of the start of new life, just as new life emerges from an egg when the chick hatches out. Painted eggs are used at the Iranian spring holidays, the Nowruz that marks the first day of spring or Equinox, and the beginning of the year in the Persian calendar. It is celebrated on the day of the astronomical Northward equinox, which usually occurs on March 21 or the previous/following day depending on where it is observed. The painted eggs symbolize fertility and are displayed on the Nowruz table, called Haft-Seen together with various other symbolic objects. There are sometimes one egg for each member of the family. The ancient Zoroastrians painted eggs for Nowruz, their New Year celebration, which falls on the Spring equinox. The tradition continues among Persians of Islamic, Zoroastrian, and other faiths today. The Nowruz tradition has existed for at least 2,500 years. The sculptures on the walls of Persepolis show people carrying eggs for Nowruz to the king. The Neo-Pagan holiday of Ostara occurs at roughly the same time as Easter. While it is often claimed that the use of painted eggs is an ancient, pre-Christian component of the celebration of Ostara there are no historical accounts that the celebration of Ostara included this practice, apart from the Old High German lullaby which is believed by most to be a modern fabrication. Rather, the use of painted eggs has been adopted under the assumption that it might be a pre-Christian survival. There are good grounds for the association between hares (later termed Easter bunnies) and bird eggs, through folklore confusion between hares' forms (where they raise their young) and plovers' nests. In Judaism, a hard-boiled egg is an element of the Passover Seder, representing festival sacrifice. The children's game of hunting for the afikomen (a half-piece of matzo) has similarities to the Easter egg hunt tradition, by which the child who finds the hidden bread will be awarded a prize. In other homes, the children hide the afikoman and a parent must look for it; when the parents give up, the children demand a prize for revealing its location. ^ a b David Leeming (2005). The Oxford Companion to World Mythology. Oxford University Press. Retrieved 10 March 2013. For many, Easter is synonymous with fertility symbols such as the Easter Rabbit, Easter Eggs, and the Easter lily. ^ a b c Anne Jordan (5 April 2000). Christianity. Nelson Thornes. Retrieved 7 April 2012. Easter eggs are used as a Christian symbol to represent the empty tomb. The outside of the egg looks dead but inside there is new life, which is going to break out. The Easter egg is a reminder that Jesus will rise from His tomb and bring new life. Orthodox Christians dye boiled eggs red to make red Easter eggs that represent the blood of Christ shed for the sins of the world. ^ Gordon Geddes, Jane Griffiths (22 Jan 2002). Christian belief and practice. Heinemann. Retrieved 7 April 2012. Red eggs are given to Orthodox Christians after the Easter Liturgy. They crack their eggs against each other's. The cracking of the eggs symbolizes a wish to break away from the bonds of sin and misery and enter the new life issuing from Christ's resurrection. ^ a b c d Henry Ellis (1877). Popular antiquities of Great Britain. p. 90. Retrieved 26 March 2016. Hyde, in his Oriental Sports (1694), tells us one with eggs among the Christians of Mesopotamia on Easter Day and forty days afterwards, during which time their children buy themselves as many eggs as they can, stain them with a red colour in memory of the blood of Christ, shed as at that time of his crucifixion. Some tinge them with green and yellow. ^ a b c d Thompson, Kenneth (21 August 2013). Culture & Progress: Early Sociology of Culture, Volume 8. Routledge. p. 138. ISBN 9781136479403. In Mesopotamia children secured during the 40-day period following Easter day as many eggs as possible and dyed them red, "in memory of the blood of Christ shed at that time of his Crucifixion"--a rationalization. Dyed eggs were sold in the market, green and yellow being favorite colors. The use of eggs at Easter seems to have come from Persia into the Greek Christian Churches of Mesopotamia, thence to Russia and Siberia through the medium of Orthodox Christianity. From the Greek Church the custom was adopted by either the Roman Catholics or the Protestants and then spread through Europe. ^ a b c d Vicki K. Black (1 Jul 2004). Welcome to the Church Year: An Introduction to the Seasons of the Episcopal Church. Church Publishing, Inc. The Christians of this region in Mesopotamia were probably the first to connect the decorating of eggs with the feast of the resurrection of Christ, and by the Middle Ages this practice was so widespread that in some places Easter Day was called Egg Sunday. In parts of Europe, the eggs were dyed red and were then cracked together when people exchanged Easter greetings. Many congregations today continue to have Easter egg hunts for the children after services on Easter Day. ^ a b Green, Nile (2006). "Ostrich Eggs and Peacock feathers: Sacred Objects as Cultural Exchange between Christianity and Islam". Al-Masaq: Journal of the Medieval Mediterranean. 18 (1). This article uses the wide dispersal of ostrich eggs and peacock feathers among the different cultural contexts of the Mediterranean – and beyond into the Indian Ocean world – to explore the nature and limits of cultural inheritance and exchange between Christianity and Islam. These avian materials previously possessed symbolic meaning and material value as early as the pre-dynastic period in Egypt, as well as amid the early cultures of Mesopotamia and Crete. The main early cultural associations of the eggs and feathers were with death/resurrection and kingship respectively, a symbolism that was passed on into early Christian and Muslim usage. Mercantile, religious and political links across the premodern Mediterranean meant that these items found parallel employment all around the Mediterranean littoral, and beyond it, in Arabia, South Asia and Africa. ^ "Egg Cetera #6: Hunting for the world's oldest decorated eggs | University of Cambridge". Cam.ac.uk. 2012-04-10. Retrieved 2013-03-31. ^ Williams, Victoria (21 November 2016). Celebrating Life Customs around the World. ABC-CLIO. p. 2. ISBN 9781440836596. The history of the Easter egg can be traced back to the time of the advent of Christianity in Mesopotamia (around the first to the third century), when people use to stain eggs red as a reminder of the blood spilled by Christ during the Crucifixion. In time, the Christian church in general adopted this custom with the eggs considered to be a symbol of both Christ's death and Resurrection. Moreover, in the earliest days of Christianity Easter eggs were considered symbolic of the tomb in which Jesus's corpse was laid after the Crucifixion for eggs, as a near universal symbol of fertility and life, were like Jesus's tomb, something from which new life came forth. ^ Allen, Emily (25 December 2016). "When is Easter 2016? What are the dates for Good Friday, Easter Sunday and Easter Monday". The Daily Telegraph. Retrieved 26 February 2016. Eggs illustrate new life, just as Jesus began his new life on East Sunday after the miracle of his resurrection. When eggs are cracked open they are said to symbolise an empty tomb. ^ Wagstaff, Natalie. "Kalo Paska - Happy Easter". ^ "Today's Recipe from Our Files: Greek Easter bread, Tsoueki". ^ "In Russia the Color Red Represents More Than You Know". TripSavvy. Retrieved 2019-03-19. ^ "How To Dye Easter Eggs with Onion Skins". Kitchn. Retrieved 2019-03-19. ^ Sorokina, Anna (2018-03-29). "How to paint Easter eggs with onion, coffee and beets (PHOTOS)". www.rbth.com. Retrieved 2019-03-19. ^ DONORSGrajewski, DONORS GOLDEN; rzej; Asia, Hołdys; Tomasz, Horbowski; Wojciech, Jakóbik; Kostek; rzej; Paweł, Lickiewicz; Filip, Lachert (2015-03-28). "The Easter Traditions in Belarus". Eastbook.eu. Retrieved 2019-03-19. ^ "How to Dye Easter eggs naturally without a box onion skins beets cabbage". seriouseats.com. ^ "Natural Easter Eggs 3 Ways!/ with nylon stockings". natashaskitchen.com. ^ a b A. Munsey Pu Frank a. Munsey Publishers (March 2005). The Puritan April to September 1900. Kessinger Publishing. p. 119. ISBN 978-1-4191-7421-6. ^ Tillery, Carolyn (2008-03-15). "Annual Dallas Easter egg hunt for blind children scheduled for Thursday". The Dallas Morning News. Retrieved 2008-03-27. ^ a b "Easter Eggs - Egg Rolling". Inventors.about.com. 2012-04-09. Retrieved 2012-09-24. ^ "Easter Eggs: their origins, tradition and symbolism". Wyrdology.com. Retrieved 2008-03-15. ^ "Scottish Country Dance of the Day | Butterscotch & Thistles". Scottish Country Dance of the Day | Butterscotch & Thistles. Retrieved 2018-01-08. ^ "Pocking eggs or la toquette". Creolecajun.blogspot.com. Retrieved 2008-03-20. ^ "If Your Eggs Are Cracked, Please Step Down: Easter Egg Knocking in Marksville". Retrieved 2008-03-20. ^ Venetia Newall (1971). An egg at Easter: a folklore study. Routledge & K. Paul. p. 344. ISBN 978-0-7100-6845-3. ^ "The End of Egg-cessive Easter Waste??". Waste connect. Retrieved 15 April 2014. ^ Anderson, F.L.M., 1864, Seven Months' Residence in Russian Poland in 1868, London:Macmillan and Co.
^ "Traditions of Great Lent and Holy Week". Melkite Greek Catholic Eparchy of Newton. Retrieved 2012-09-24. ^ Terry Tempest Williams (Sep 18, 2001). Leap. Random House Digital, Inc. Retrieved 7 April 2012. After the Ascension, she travelled to Rome and was granted entrance to the court of Tiberius Caesar. At dinner, she told Caesar that Jesus had risen from the dead. He did not understand. To explain, Mary Magdalene picked up an egg from the table. Caesar responded by saying that a human being could no more rise from the dead than the egg in her hand turn red. The egg turned red. ^ Red eggs at Pascha Easter he Most Useful KNOWLEDGE for the Orthodox Russian-American Young People,” compiled by the Very Rev’d Peter G. Kohanik, 1932-1934. ^ "Your Guide to the Food and Traditions of Greek Orthodox Easter". ^ "Red Easter Eggs - Questions & Answers". ^ "Photos: Painted eggs across Tehran". The other Iran. 2016-03-26. Retrieved 2018-04-02. ^ "H2g2 - The Easter Bunny". BBC.com. Retrieved 2012-09-24.